Holy Cow! This book is actually interesting. 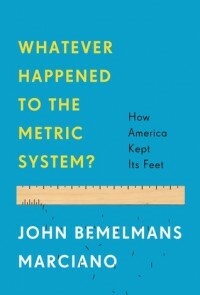 I grabbed this book, having a mild curiosity in wanting to find out why us Americans measure in feet, travel in miles, and weigh in pounds, versus seemingly the rest of the world, but what I got was so much more! Seriously, I’m not just blowing this out of proportion. (Sorry for the bad pun, but get it? Proportion? Ok, never mind.) The author starts talking about recent presidents and Dan Rather and then pulls some mind tricks. He breaks the chapters up by fractions, such as 2/16 being one eighth, and then talks about Jefferson, Franklin, and Adams, and how the decimal system came about. Then he talks about money. We all are interested in money, right? And he goes on and on. What I’m saying is this book is much more than inches versus centimeters or ounces versus cups, this is about math and human interest and history. Many things I have never heard of or learned before, such as France’s fascination with Franklin, and how he played it up when he went there. Kudos to John Bemelmans Marciano, he just made learning entertaining; that’s awesome. Oh, and speaking of that French connection with Franklin, the author also penned the children’s favorite MADELINE books. So, yeah, he’s good stuff. Thanks Bloomsbury for providing this electronically for review; this book rocks.